Foundation 1 has served Kansas City homeowners since 2001 with a variety of Foundation Repair and Basement Waterproofing Services. We offer a free evaluation and are one of the top reviewed foundation repair contractors in KC. We would love to work with you as your foundation company! If your foundation is settling, sinking, cracked, allowing water intrusion, or has bowing or leaning walls, you have come to the right place. 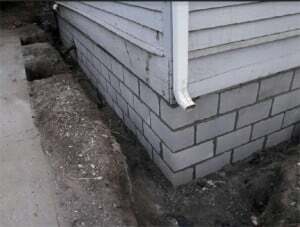 Repairing basements and foundations is our specialty! CALL US TODAY TO SET UP A FREE EVALUATION! 816-682-8440. We work throughout the KC Metro, including Overland Park, Lenexa, Shawnee, Prairie Village, and Olathe, in Kansas. And Lee’s Summit, North Kansas City, Independence, Parkville, KC MO, Liberty in Missouri, among others.